Demand for pesticide adjuvants in the US is forecast to grow 3.8% yearly through 2021. Genetically modified seeds will continue to represent a growing share of crops planted, though seed varieties engineered with resistance to insect pests and diseases will limit demand for insecticides and fungicides and their corresponding adjuvants. Glyphosate will continue to represent the largest single end use for pesticide adjuvants. 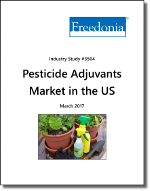 This Freedonia industry study presents historical demand data plus forecasts for 2021 by product (surfactants & emulsifiers, drift control agents, oil concentrates, compatibility agents, water conditioners), pesticide (glyphosate, atrazine, 2,4-D, S-metolachlor, dicamba, other herbicides, insecticides, fungicides), and market (agriculture, commercial, consumer). The study also evaluates company market share and provides competitive analysis on industry participants including Agrium, Akzo Nobel, Clariant International, Crodo International, Dow Chemical, Evonik, Helena Chemical, Huntsman, Land O’Lakes, Lonza, and Solvay.